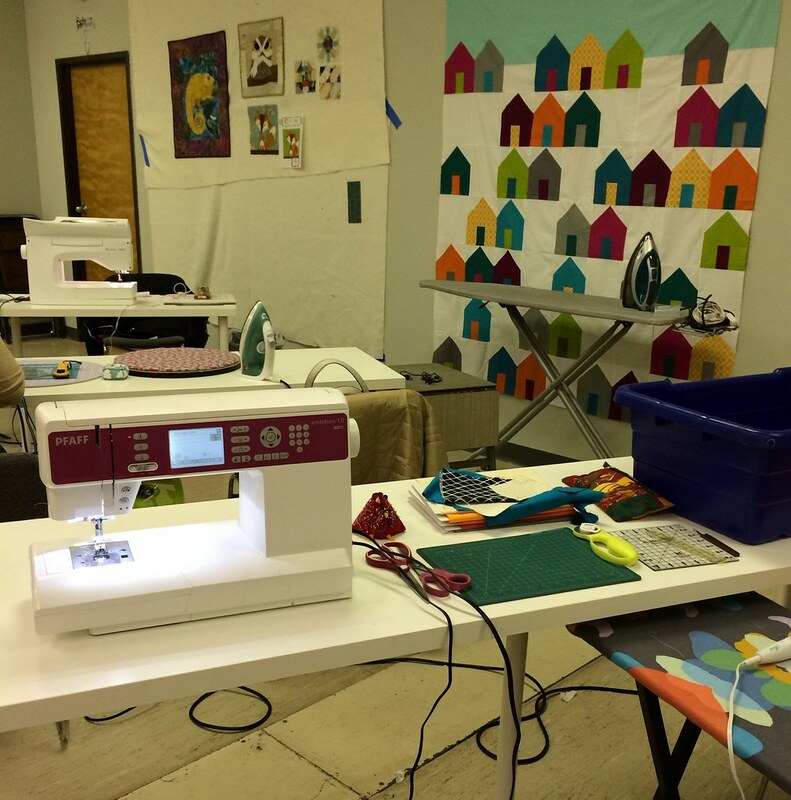 Yesterday, I took a class at Pink Castle Fabrics, a thing I do from time to time. I have taken at least four - two on applique techniques, and one on skirt making, and this one. And Pink Castle does a great job on finding great teachers. And I hope to take many more, because taking classes is, for me, the best way to learn something. Setting up in the Pink Castle classroom. Paper piecing examples farther along the wall, nearer is a quilt top of the pattern Suburbs by Cluck-Cluck Sew which is the sample for another class. 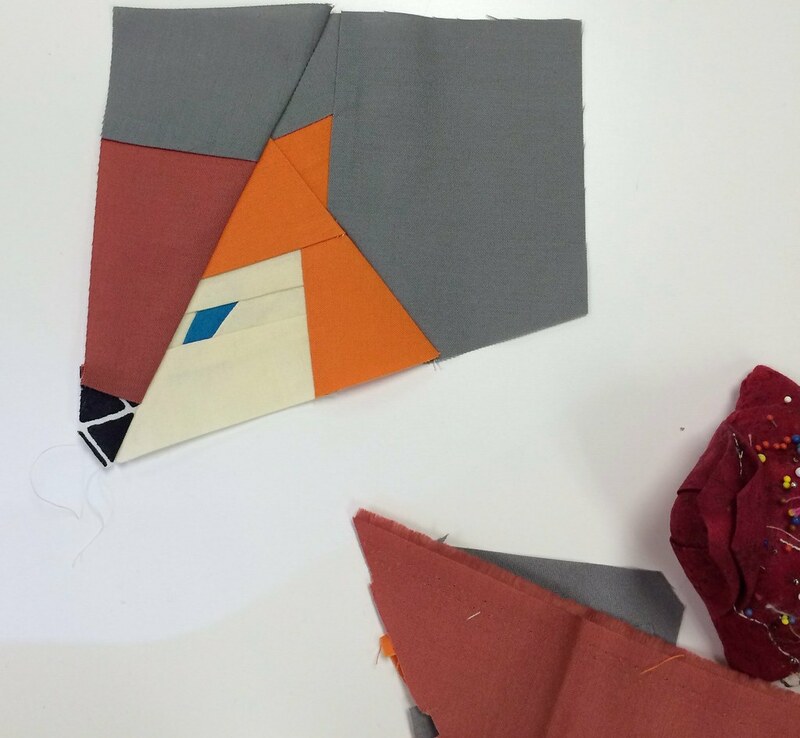 Anyway, yesterday was a paper piecing class taught by Kathy Koch of Thread Bear Quilting & Embroidery. And, after my first paper piecing experience, I figured this would be a morning spent thinking about things that made my brain hurt, but it was surprisingly painless, first of all, because Kathy laid out the rules and the order you have to do each step so well, and then once I realized that we were building the pieces upside down. I will not attempt to explain it further, or my brain will begin to hurt. What I did learn, though, is that my machine is not great about those tiny seams. That eye is being held together by the force of the ironing, I expect, one of those small seams came apart when I took out the paper. I started backstitching my seams after that, to keep them more together. It's one of my quibbles with my machine - the first two stitches are super loose, then all the following stitches are just fine, but if the seam is only 6 stitches long, that becomes more of a problem. And when you're pulling out the paper under those loose stitches, well, that looseness spreads. And am now spending my free time (ha!) looking at blocks and deciding how they could be paper pieced. Because, well, look at all the tiny detail you can cram in! I love tiny detail. 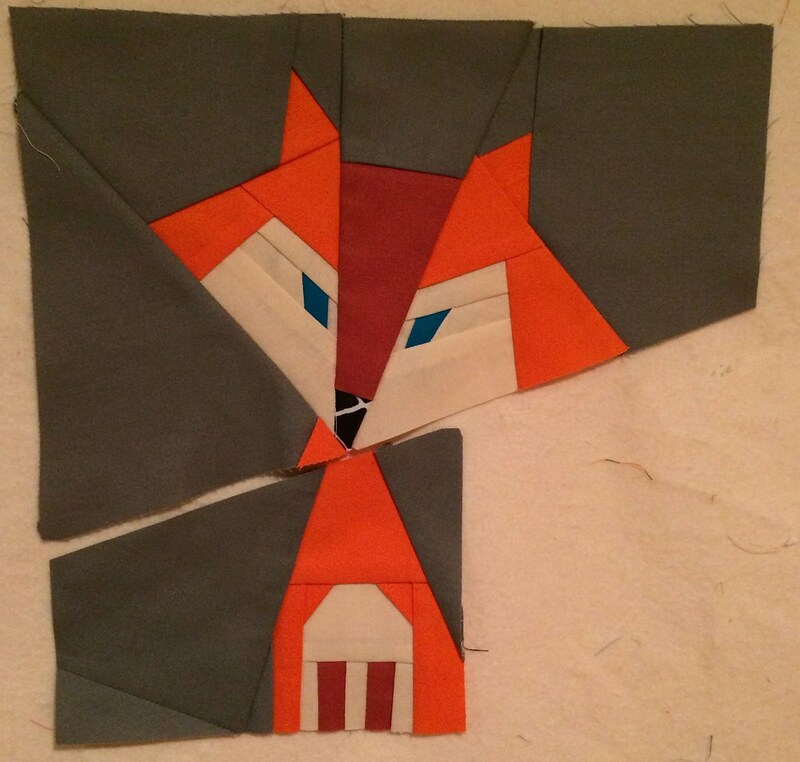 I think I will probably not do many adorable animals, but the idea of doing traditional blocks in a crazy scaled down way appeals to my particular madness. And, I may finally attempt New York Beauty!